The topics in this section describe how to create and use the ListView and GridView controls to display data in a customizable list or grid. A control that presents a collection of items in a list that can scroll vertically. A control that presents a collection of items in rows and columns that can scroll horizontally. You can use a ListView or GridView control in XAML to display your data collections, such as a list of contacts, images in a gallery, or the contents of an email inbox. This tutorial walks you through the steps to add a list view to a Windows Runtime app using C++, C#, or Visual Basic. This tutorial walks you through the steps to add a grid view to a Windows Runtime app using C++, C#, or Visual Basic. This tutorial shows you how to change the selection mode of a list or grid, and how to make an item clickable. When a ListView or GridView is bound to a data source that contains groups of data, you can display the grouped data in the list or grid. Learn how to use UI and data virtualization to improve the performance of a ListView or GridView. This topic describes the styles and templates for the GridView control. This topic describes the styles and templates for the GridViewItem control. This topic describes the styles and templates for the GridViewHeaderItem control. This topic describes the styles and templates for the ListView control. This topic describes the styles and templates for the ListViewItem control. This topic describes the styles and templates for the ListViewHeaderItem control. This topic describes the styles and templates for the GroupItem control. This section contains item templates that you can use with a ListView control. 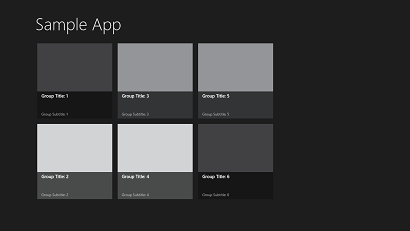 This section contains item templates that you can use with a GridView control.